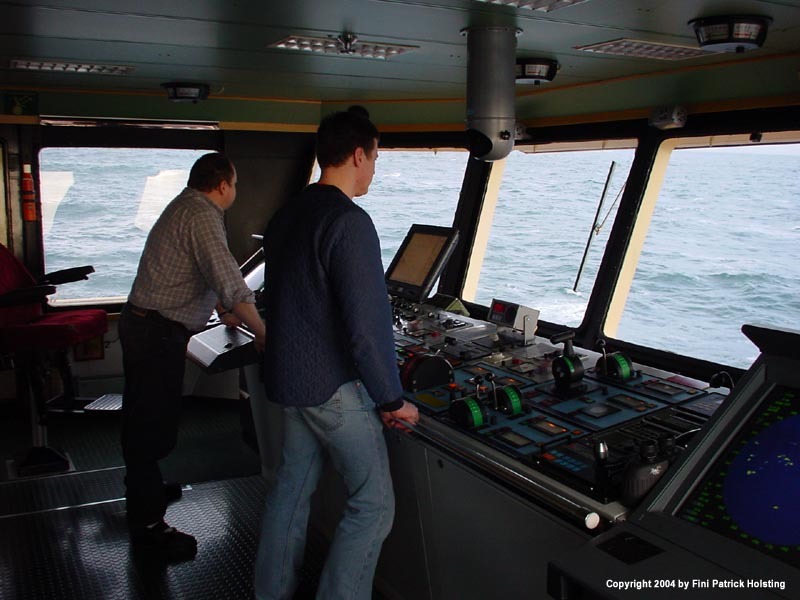 The forward manouvering console, which isn't used much when alongside rigs. In the middle are the two main propeller pitch controllers, in between them the rudder controls (no wheel here). To the right of these are the bow-, stern- and azimut thruster control levers. On the far right one of the radars. 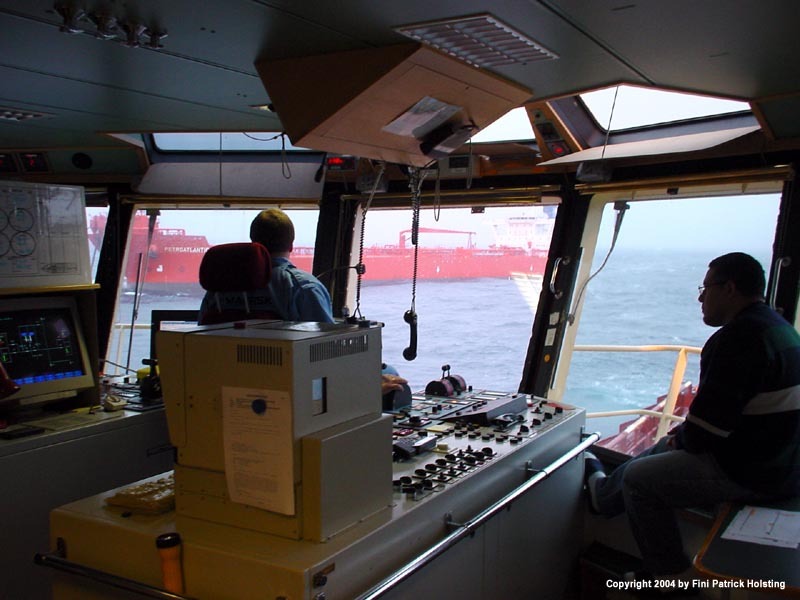 Approaching the FPSO with the Captain at the manouvering consoles. In the left of the picture is the navigational chart table, to the right the radio station and the ship stability computer. Aft of the FPSO was the shuttle tanker Petroatlantic. 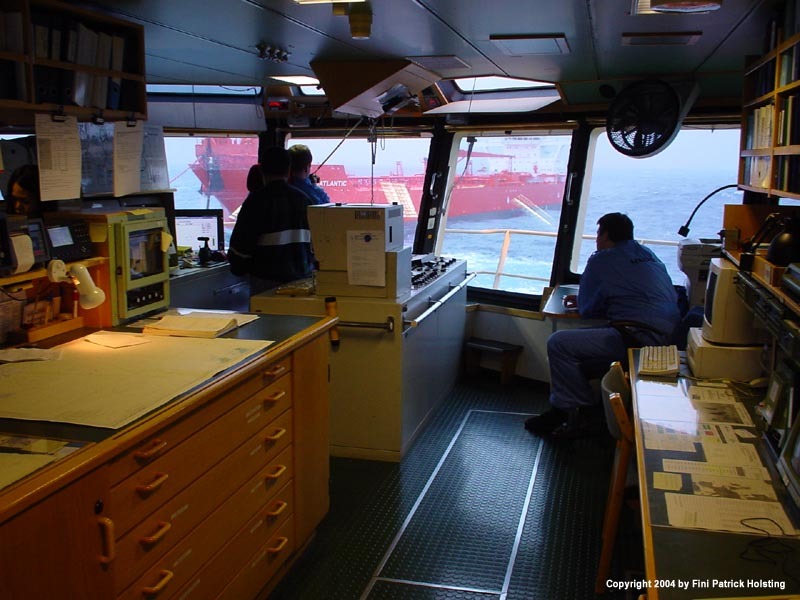 The weather was bad and grew worse, so the operation was cancelled by the FPSO before it even began. Captain Jan was manouvering. In the bottom left corner the ship's cargo control system can be seen. This computer had diagrams over all cargo and piping arrangements on board and valves etc. could be manipulated from here. 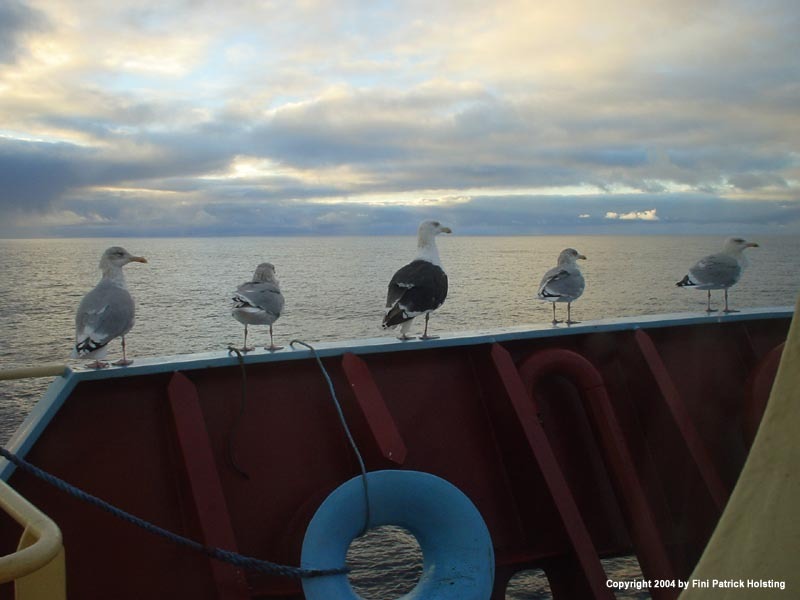 Sometimes working at sea provides for some entertaining situations... I just couldn't beleive the symmetric pattern these seagulls were sitting in! 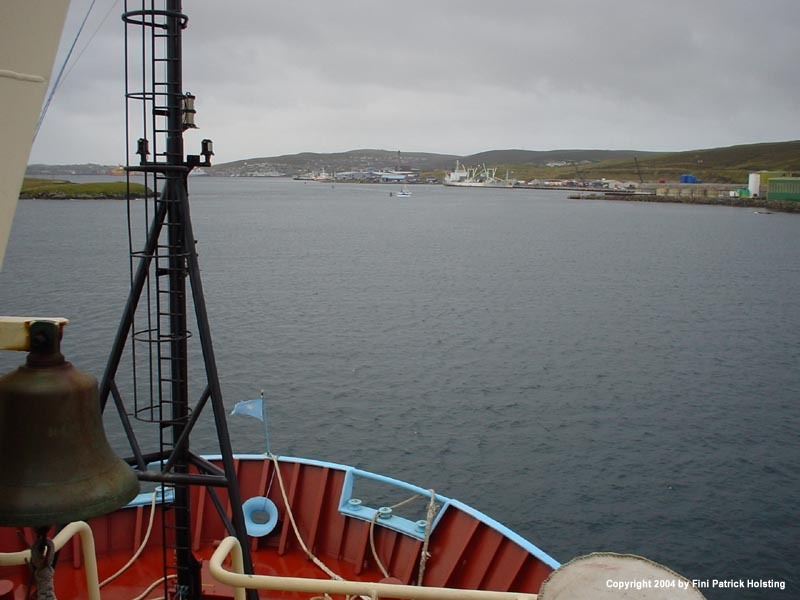 While working on the oil field, we were asked to go to Lerwick, Shetland Islands, to pick up some cargo and drinking water for a production platform. This is the Shetland Islands. 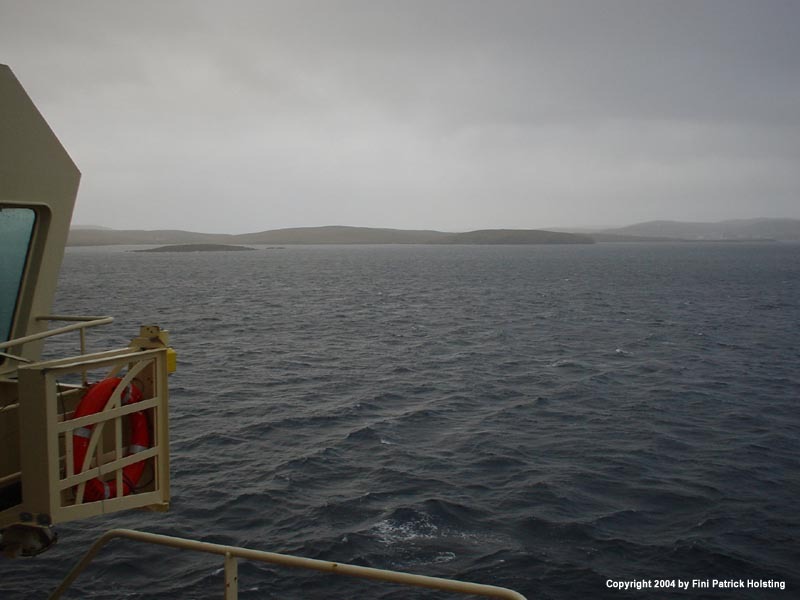 Making our way into the sound between the two main islands, heading for Lerwick. 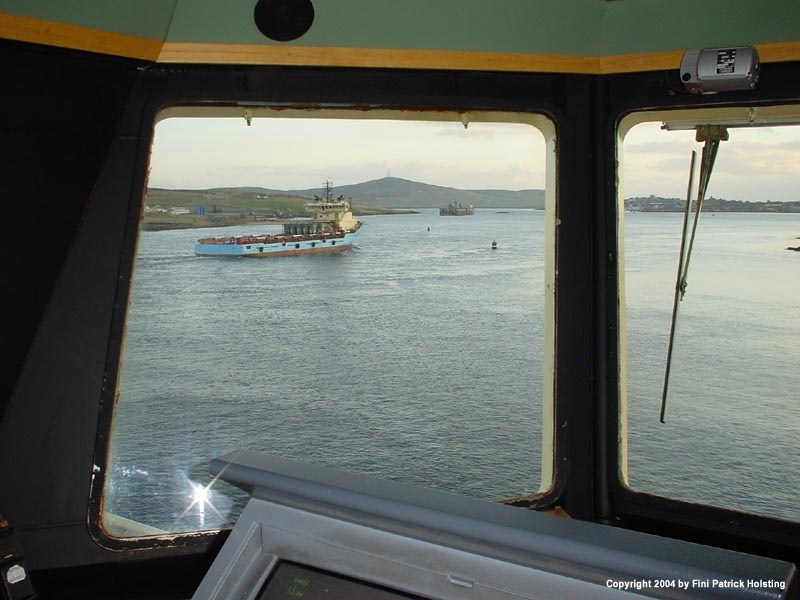 The Chief Officer enjoys the view from the bridge wing (right). 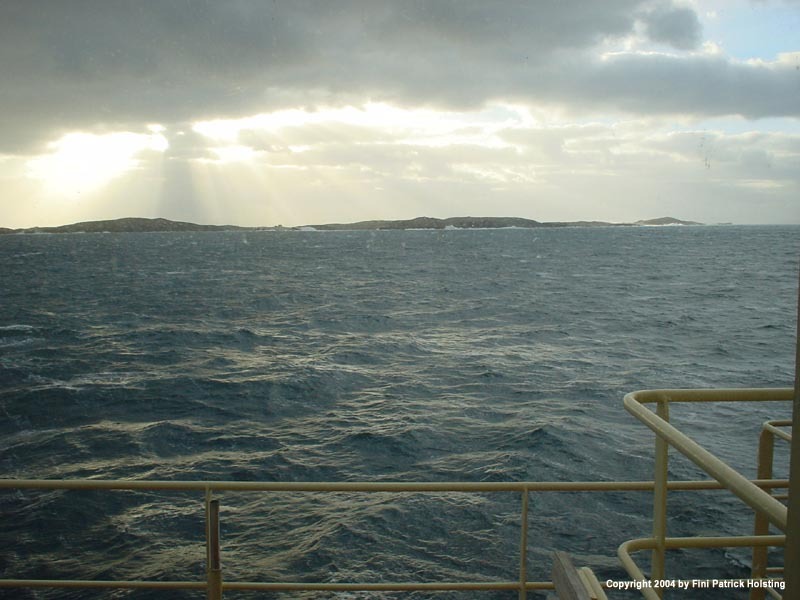 Upon leaving Lerwick again, bad weather reached us, and we had to leave the oil field again and ride out the storm in a bay by the Shetland Islands. 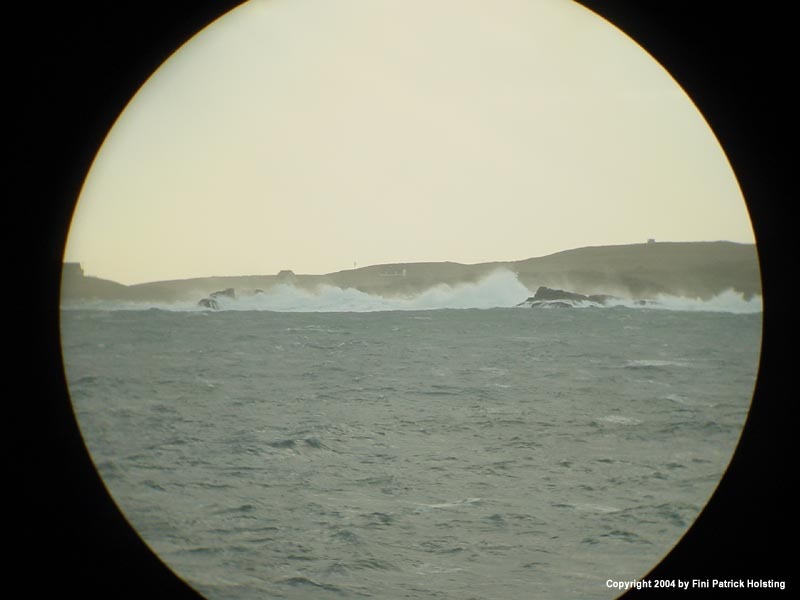 Huge waves breaking onto the rocks of Shetland. 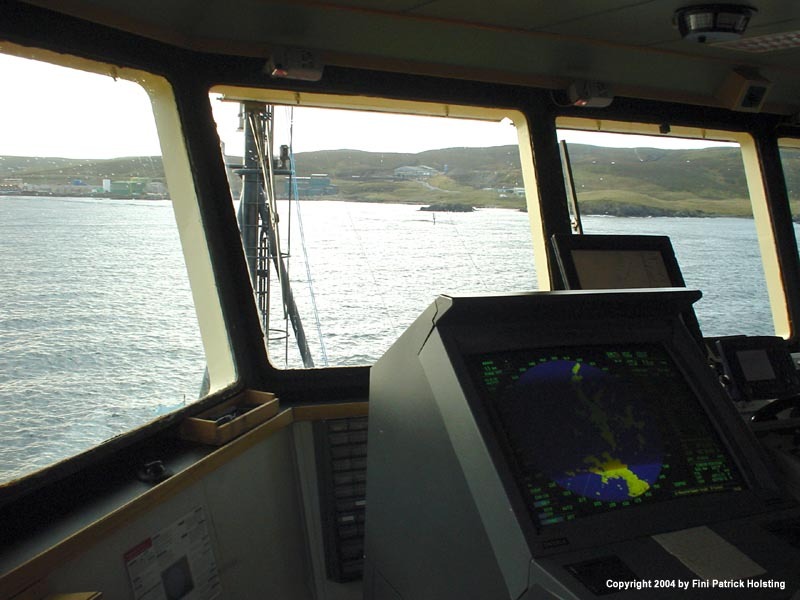 The Captain and 1st Officer pondering where to go to get out of the wind, while waiting at the Shetland Islands for better weather on the oil field. Deciding to go to port while waiting for better weather, we made our way to Lerwick again. 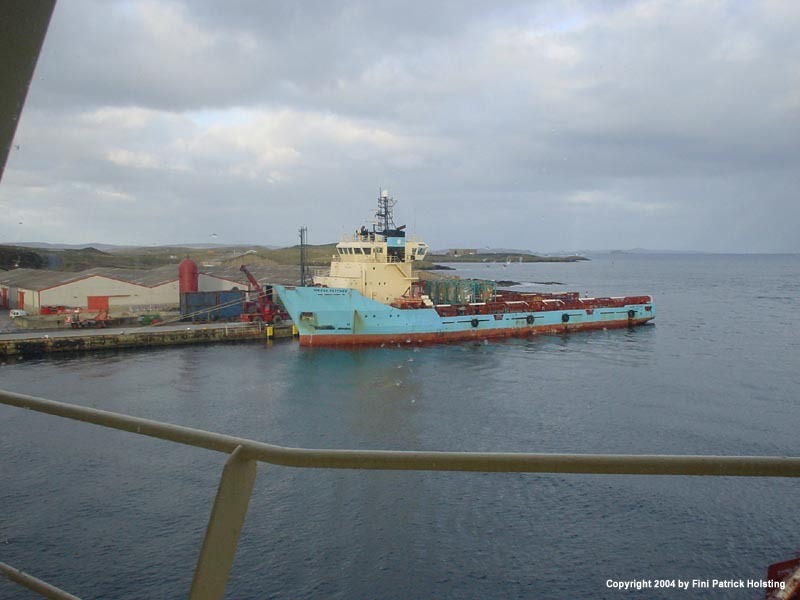 Maersk Fetcher was also berthed in Lerwick, but left shortly after our arrival. Maersk Fetcher leaving toward the setting sun. 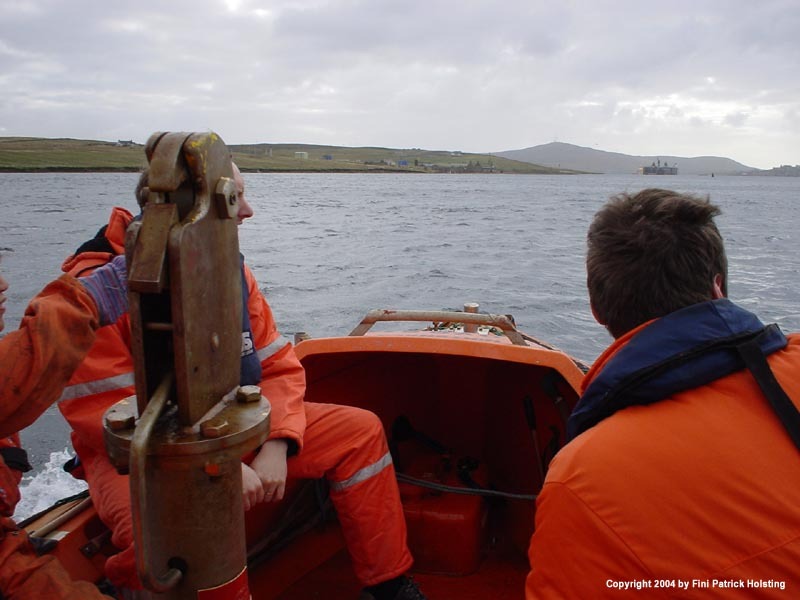 They were operating west of the Shetland Islands at the time. Out there weather can get really nasty! Since we didn't have any cargo operation to do during this port stay, we had lots of time for other tasks and a bit of fun. Here a couple of the officers and I are taking the rescue boat for a ride. 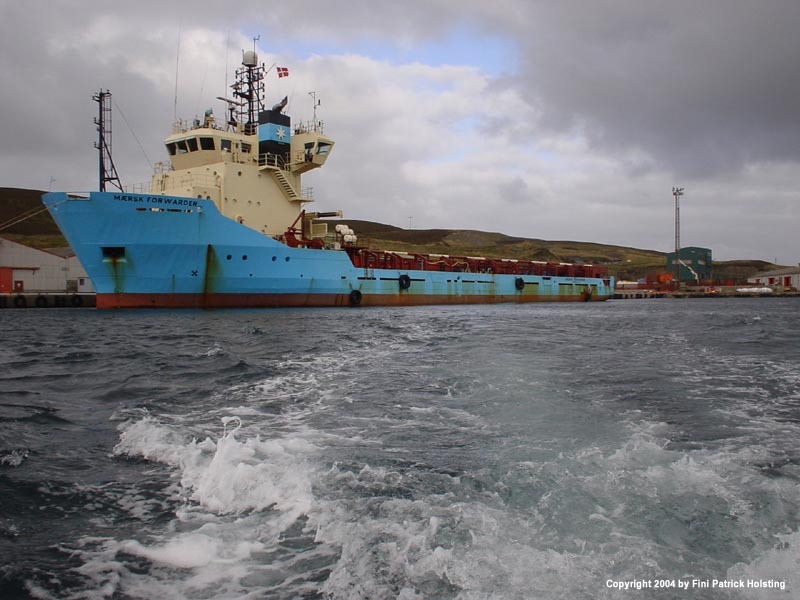 When launched in 1992, Maersk Forwarder and her sisterships were amongst the largest supply vessels in the world, but larger ones have since been built. They are still considered quite big, though. 1st and 2nd Officer and fellow cadet Katrine talking about other vessels in the port, while I'm driving the boat. We were on our way to visit a fishing vessel from the Faroe Islands, since both officers seen in this picture are from the Faroe Islands. 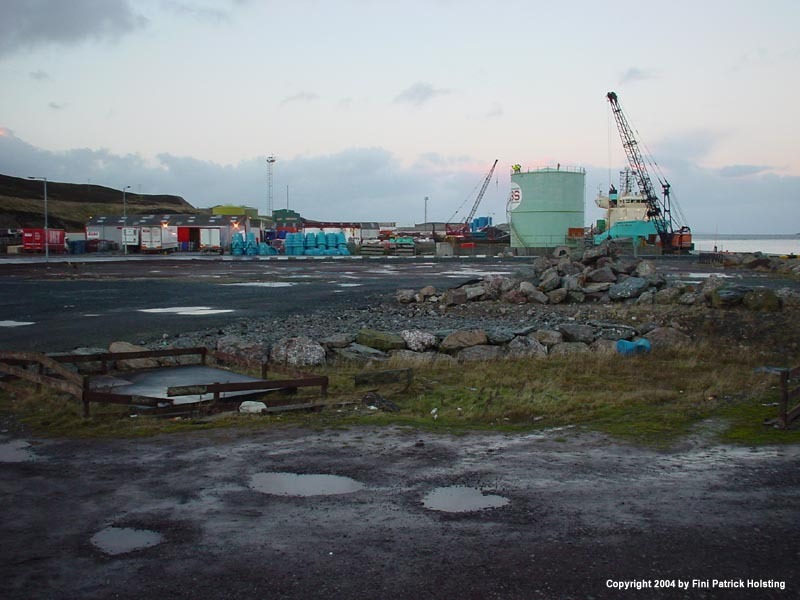 The port of Lerwick as seen from shore side. 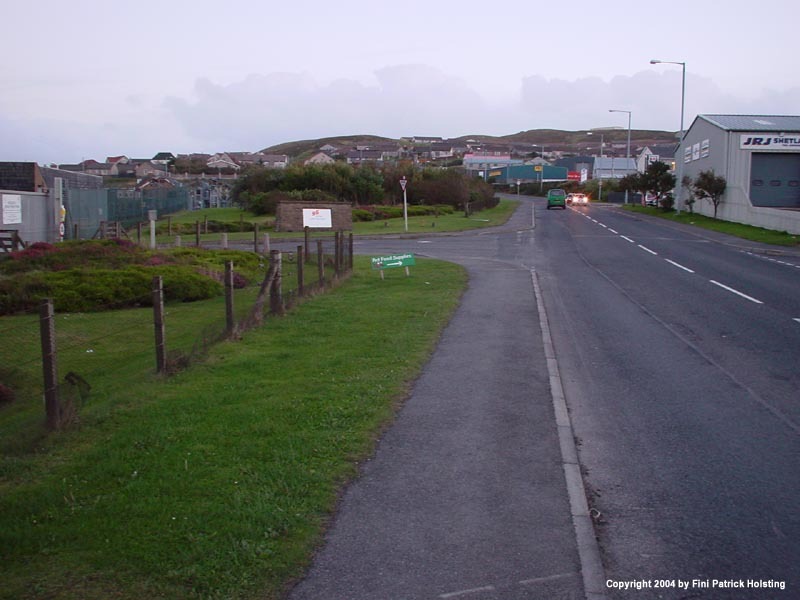 My fellow cadet Katrine and I decided to go see what Lerwick looked like, so we took a walk towards town. 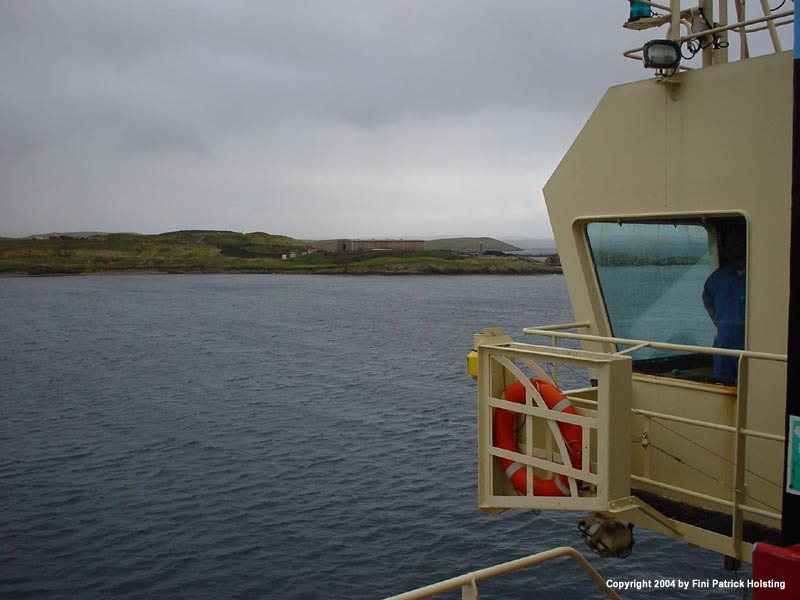 It turned out to be a rather long walk to town from the port, but we wanted to see the Shetland Islands, and that's just what we did. 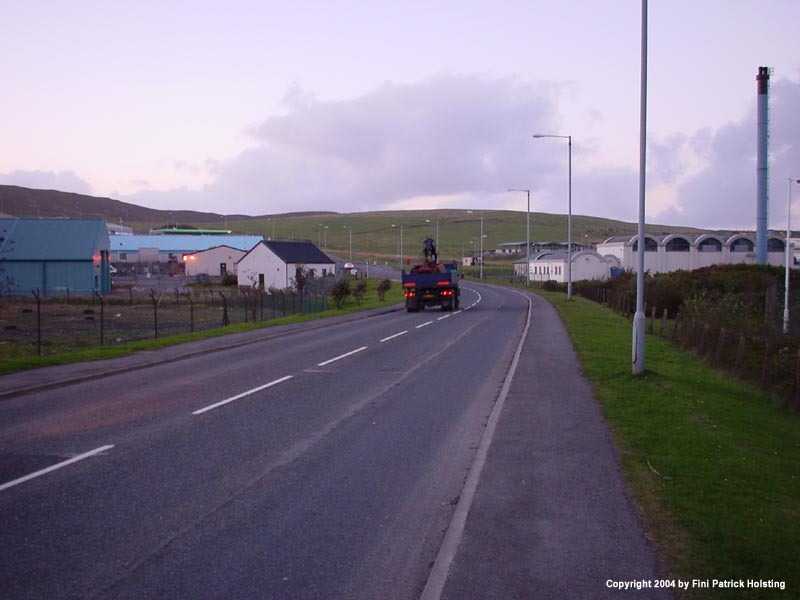 We eventually reached downtown Lerwick, a very cozy place, but I don't have any pictures from there. There was a pool bar just outside the port, so we often went there in the evenings. 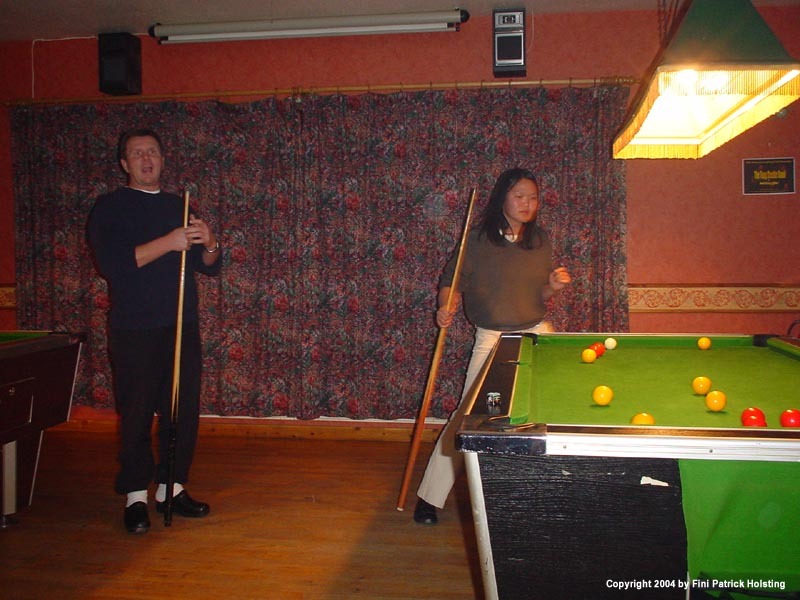 Here the Chief Engineer is shooting pool with Katrine. Here we're having a tour of the engine room. 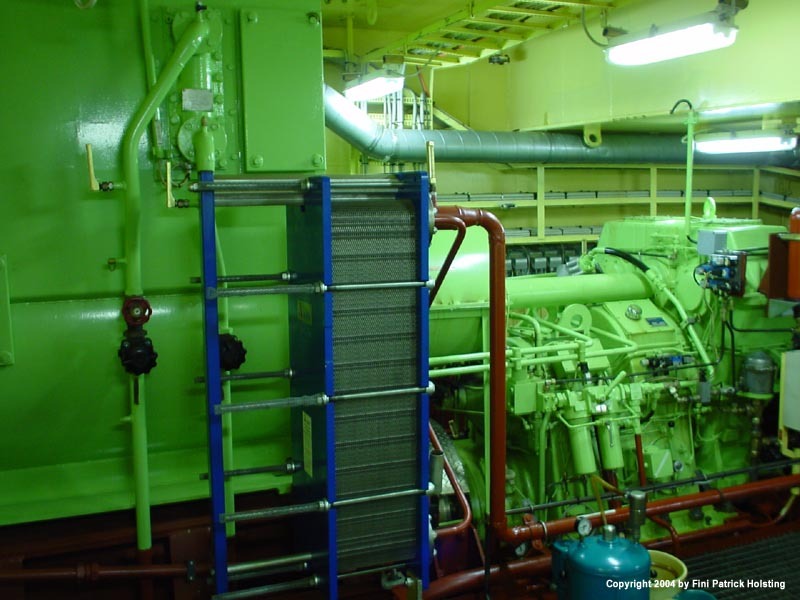 Maersk Forwarder has a very compact and tidy engine room, with easy access to all machinery, and it was a pleasure to work in. Also, the noise levels were low and the temperature always comfortable. To the left are two compressed air tanks, behind these the auxiliary power generators. The grey thing in the middle is the fresh water generator. In the foreground a couple of pumps are visible. A closer look at the two auxiliary generators. 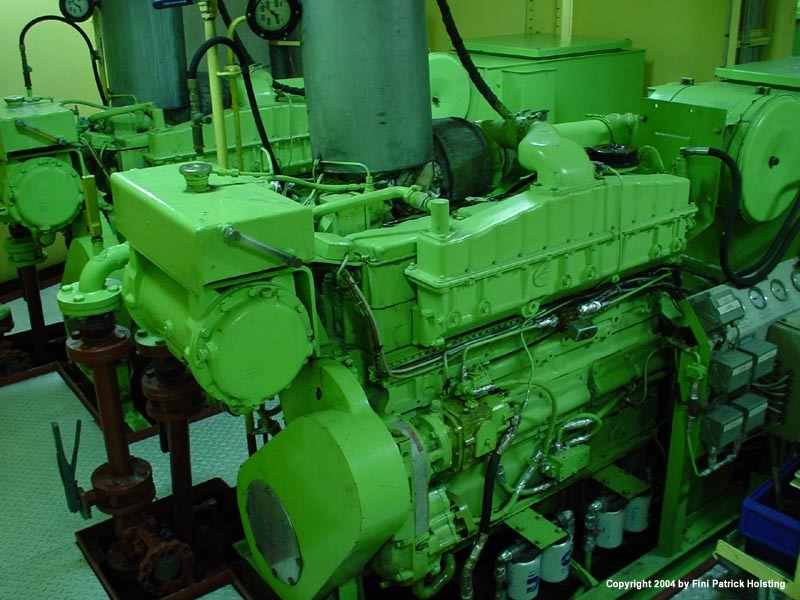 The size of large truck engines, both diesel engines powered a generator producing around 250 kW of electrical power each. 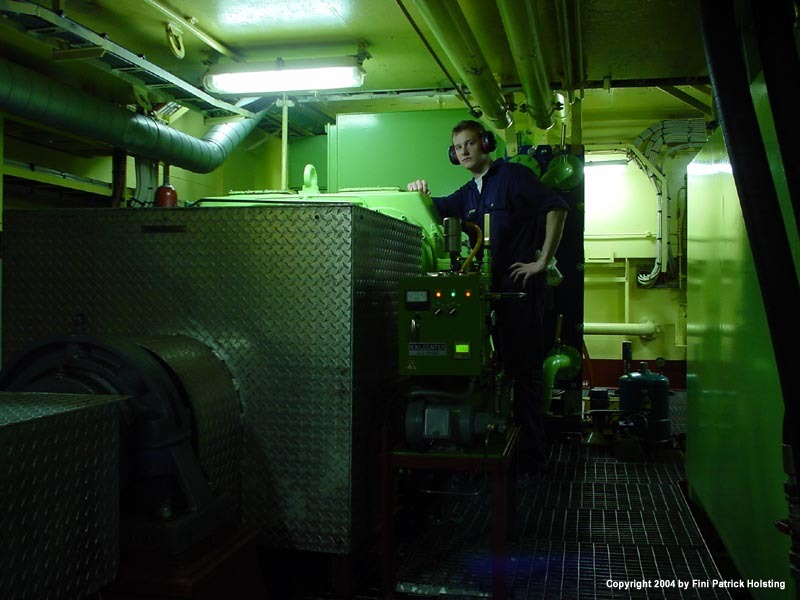 This was just enough to power the ship during port stay when most of the engine room machinery was not running. 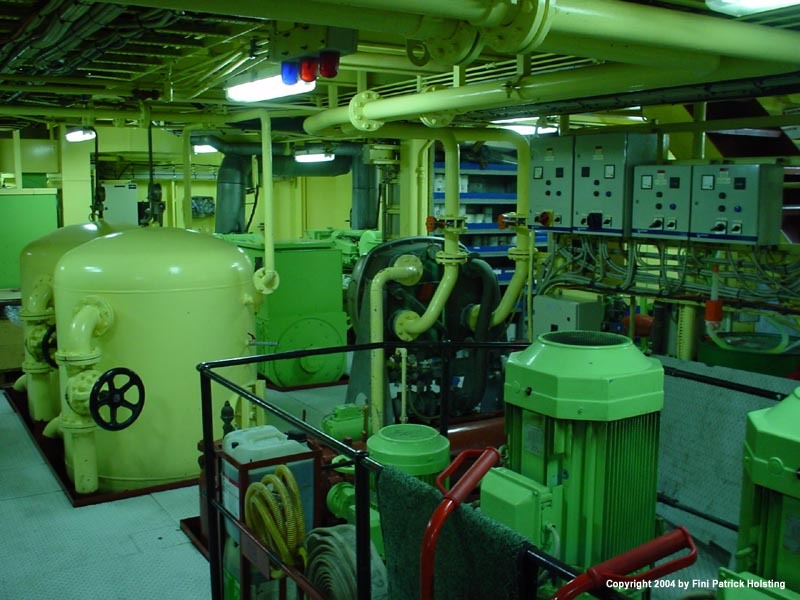 During sailing the ships electrical power is supplied by two shaft generators driven by the main engines via a gear. These large tanks contain cement powder, which the rigs use in connection with drilling operations. 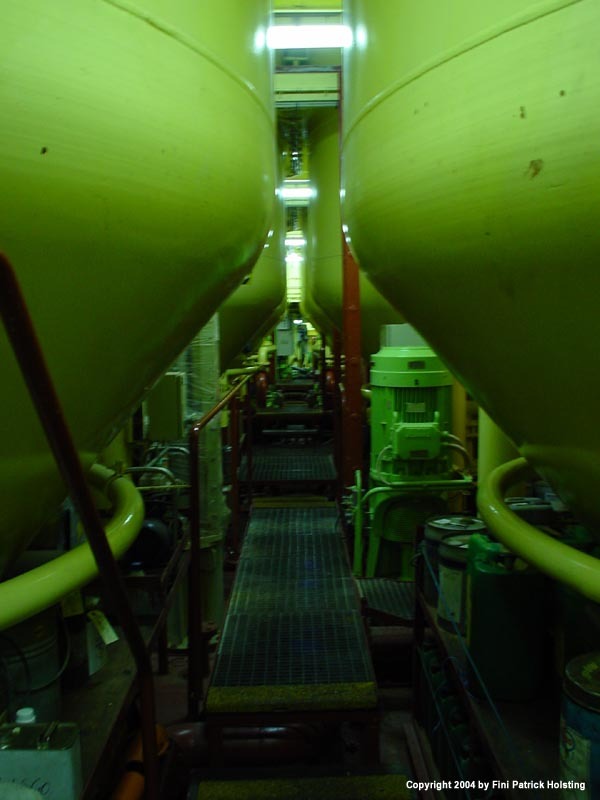 These tanks are placed directly under the main cargo deck, and are discharged using compressed air. Here I'm standing beside the before mentioned gear and behind me is one of the shaft generators. 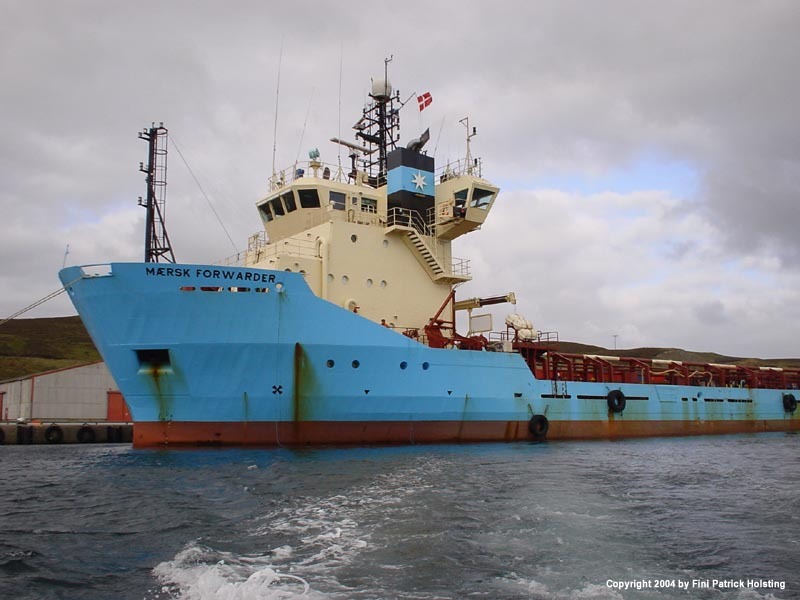 Maersk Forwarder has a very flexible engine setup and can clutch out both generators and propellers independantly. A view of the port side reduction gear, which is identical to the starboard one in the previous picture. The reduction gear is basically just a set of gear wheels with a lubricating oil sump and -pump as well as a couple of clutches. Looking forward from aft of the cement silos. 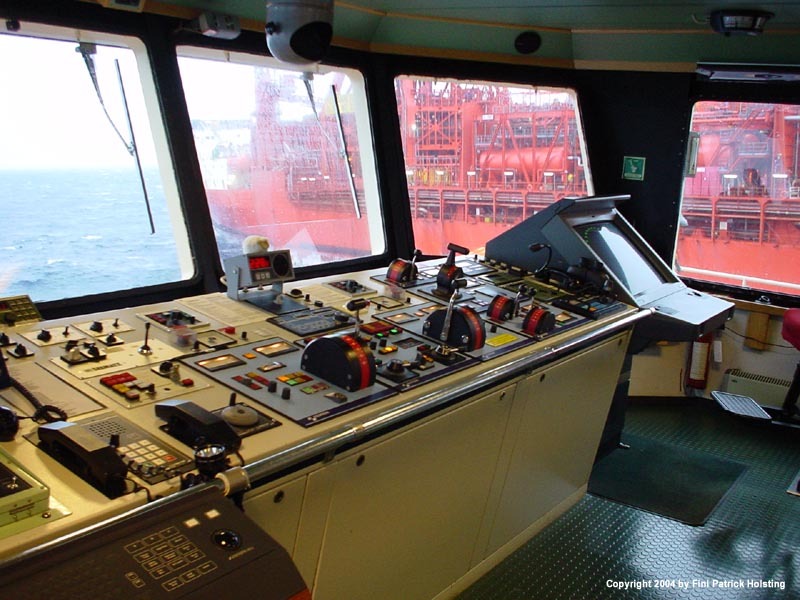 The Maersk Forwarder has a rather cramped and well-filled engine room, but it's actually a nice place to work. Aft of the powder cement silos and main gears are the shaft tunnel. This part of the engine room contains the propeller axles and bearings as well as a couple of filters and pipes. 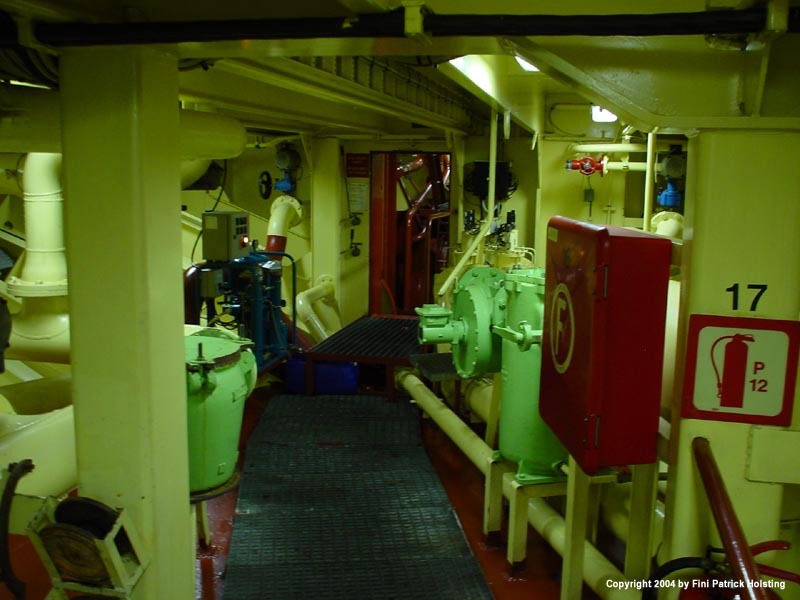 The ceiling height is rather low in this part of the engine room, since it's squeezed in between the keel and the cargo deck. In the middle of the picture is the door to the stern thruster room. 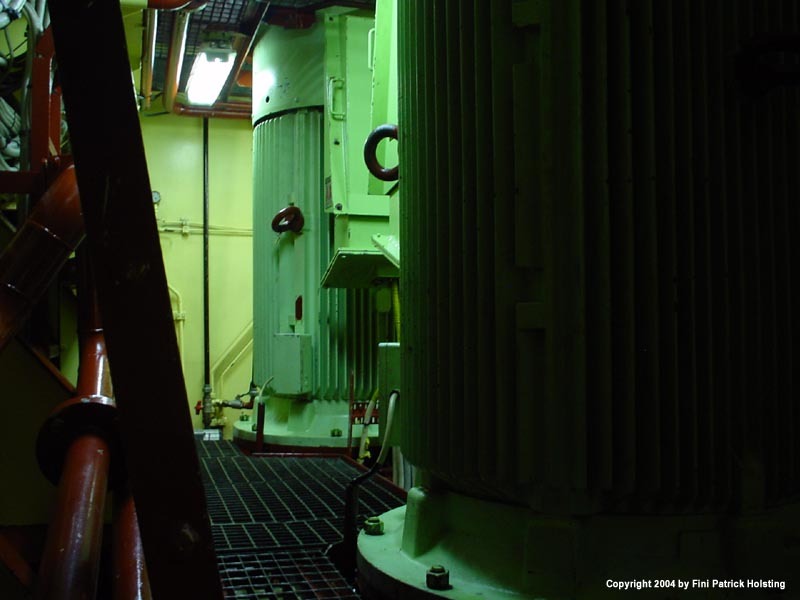 Looking into the very cramped stern thruster room, the two electric motors, one for each thruster, are visible. Each are about the same height as a grown person, and puts out around 600 kW (800 BHP), roughly eight times that of a standard family car.